When is Best Weather to Get Your Windshield Chip Fixed ? When is Best Weather to Get Your Windshield Chip Fixed? When is the best weather to get your windshield chip fixed? While there are better days weather wise that are easier and quicker for us to fix your windshield chip, a windshield chip or crack can be fixed in all kinds of weather if you take the necessary precautions. The best weather for windshield chip repair is probably just what you thought…on sunny warm days. This type of weather makes it easier for the tech to examine the damage and make sure it cures properly. But if you happen to get a windshield chip in horrible weather, don’t wait for a sunny day to get it fixed. If you wait too long, windshield chip damage will usually spread which will then result in a need for a windshield replacement. Rainy Weather- Simply keep your car parked in a dry area, such as a garage, for 12-24 hours before the repair is scheduled. The glass must be completely dry before we repair it. Only a few drops that can be wiped off easily will cause no harm. However, if the car is left out in the rain until the water seeps deep into the damage, it can be very difficult to get out before we repair it. 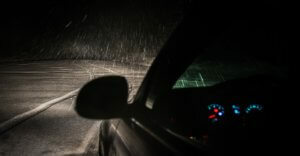 Snowy Weather– Just as above, make sure the car is kept in a dry area before the repair to ensure no moisture seeps into the glass. When Windshield Repair Doc arrives, we will also heat up the glass to make sure it is the correct temperature for a repair. Too Hot Weather- If the glass is too hot, it must be cooled down before proceeding with repairing your windshield. We will ask you to park in the shade if possible and if this does not cool the glass enough, we will turn on your A/C for 10 minutes to lower the glass temperature in order to ensure the best glass temperature for windshield chip repair. What is the difference between a windshield chip and crack?